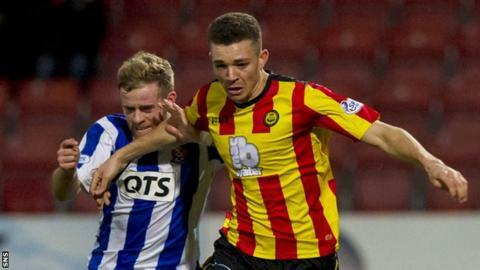 Partick Thistle left-back Aaron Taylor-Sinclair is destined for a summer move to English football, according to manager Alan Archibald. The 23-year-old has been linked with Celtic and Aberdeen, but Archibald expects him to move further afield. Thistle will miss out on compensation should he move out of Scotland at the end of his contract in the summer. "He's stated that he wants to go and play down south," said Archibald. "We wish him all the best." The age limit for compensation is 23 for cross-border moves rather than 24 for internal transfers. "He turned 23 last month, so we'll lose out on that, but we have had three great years from him," said Archibald. "He has barely missed a training session or a game. I think he has only missed one game this year, through suspension. He's a true professional." Aberdeen-born Taylor-Sinclair joined Thistle in 2011 for an undisclosed fee from Montrose and newspaper reports have linked him with clubs in the English Championship. "I think Aaron's going to go," added Archibald. "He has said that all along. "He's been a credit to himself, his family and the club in the way he has carried out his business on the pitch." Thistle have secured a second season in the Scottish Premiership and presently sit seventh going into the final afternoon of matches. Archbald is hopeful of staying there to increase the bonus money available to him as he looks to make summer signings of his own. "It makes a massive difference," he said. "The chairman has already said that any more money we get will go right back into the player budget, so it can only help us to move forward. "It could be the difference between getting an extra player or someone we thought we couldn't afford."